Tiana found our flyer and asked for help in creating Bradner Garden’s first outdoor concert. We brainstormed with her over the phone and told her about Seattle’s Department of Neighborhoods’ Small Sparks grant program. Tiana got the grant, found musicians, gathered neighbors, had posters and postcards made, then held a fantastic summer evening concert. She did a wonderful job of jumping into a first project. 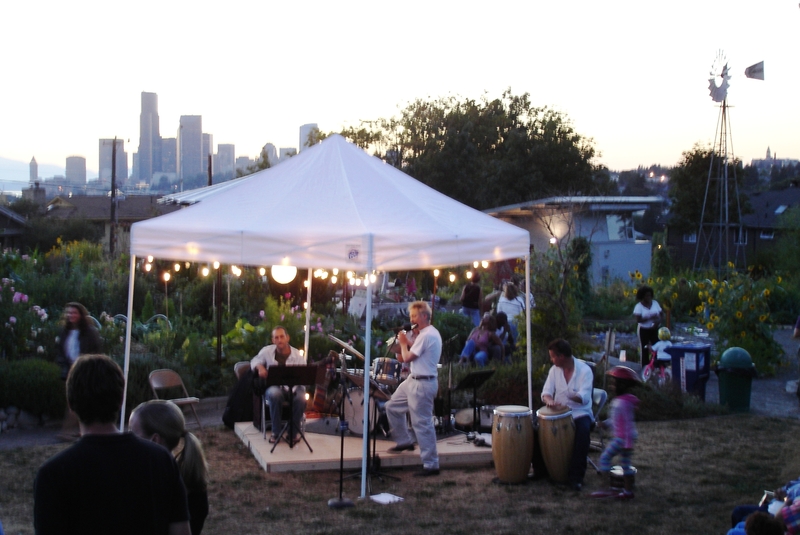 It was a thrill for us to take a tiny part in this first concert at Bradner Garden. Bradner Garden is a wonderfully mature P-Patch and neighborhood park that was overdue for such an honor.